When did you last get excited about finding a weevil? 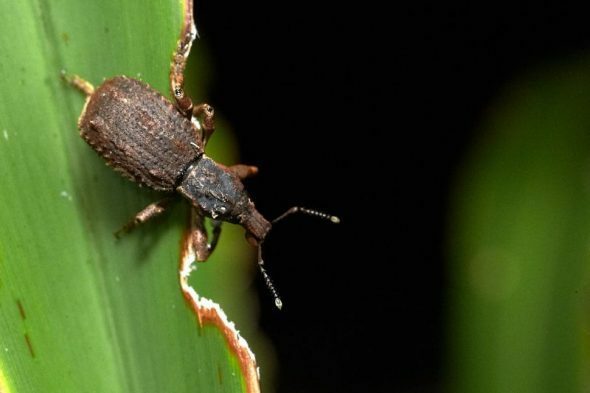 They get a lot of bad press as pests of crops and stored food, but finding two rare weevil species was one of the highlights of a recent Te Papa expedition to Dusky Sound in Fiordland. 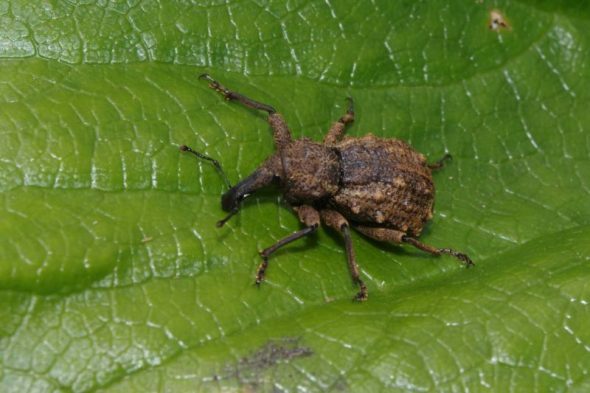 I first learnt about some of New Zealand’s charismatic mega-weevils in 1980, when a landmark amendment to the Wildlife Act first provided protection to a select few insects, spiders and snails. The ten weevil species that were granted protection were all large, flightless and highly vulnerable to predation by introduced rats and mice. Most had specialised feeding habits – often reliant on a single plant species – thereby increasing their vulnerability to extinction. 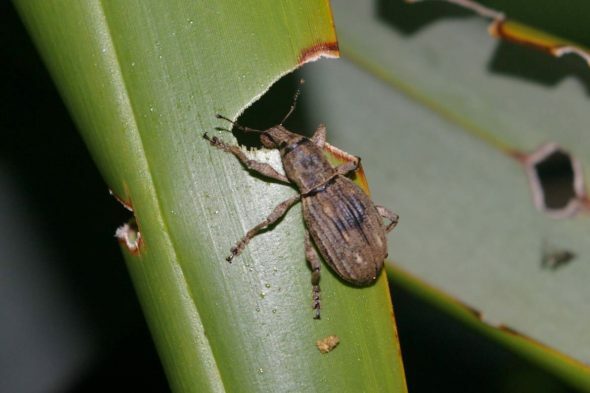 The protected weevils included the two species that we found in Dusky Sound: the punui weevil (or knobbled weevil) Hadramphus stilbocarpae, and the flax weevil Anagotus fairburni. The punui weevil was probably extinct at its type locality by the time it was described in 1971. 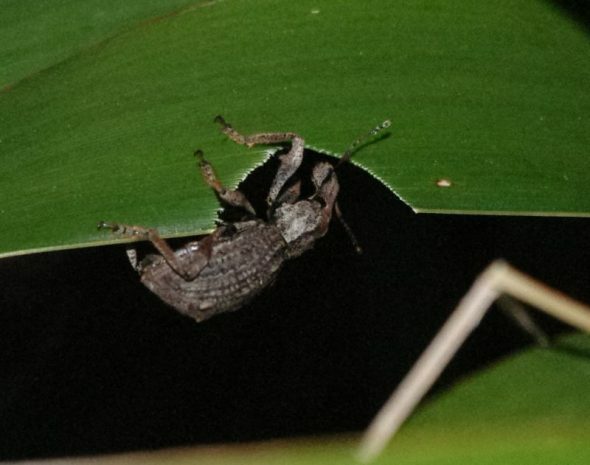 First discovered on Big South Cape Island, south-west of Stewart Island, in 1955, these large weevils were found feeding at night on the huge leaves of punui (Stilbocarpa lyallii). The devastating impact of the 1963-64 irruption of ship rats on the birds and bats of Big South Cape Island is well-known by conservationists, but many large beetle species also became extinct there at the same time – including both the punui weevil and flax weevil. Fortunately the punui weevil had been discovered on the rat-free Snares Islands (105 km south of Stewart Island) in 1967, feeding on a related species of punui (Stilbocarpa robusta). It was one of the species that I was looking forward to seeing when I first visited the Snares Islands to study snipe in 1982. It took a couple of weeks, but late one night while out snipe-hunting I had paused alongside a large punui plant when I became aware of a quiet ‘scrunch scrunch scrunch’ near my left ear. 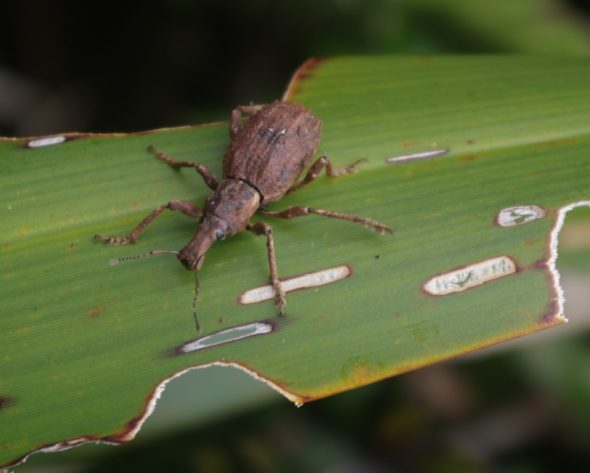 It was the sound of a punui weevil munching on the edge of a leaf! I have found many large weevils since, but that first one remains the only one detected by its noisy eating. 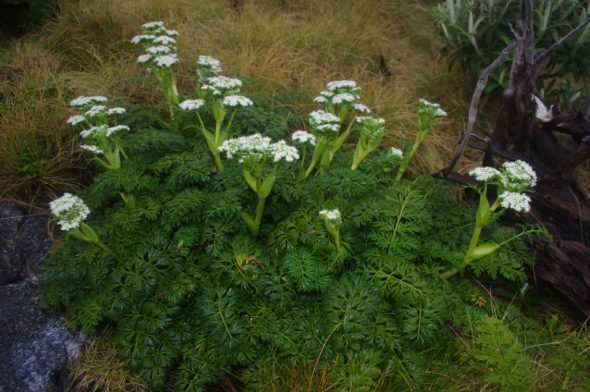 It was a great surprise when the same weevil species was subsequently found on a rat-free island in Breaksea Sound, Fiordland, feeding on a completely different host plant – the carrot-like Anisotome lyallii. 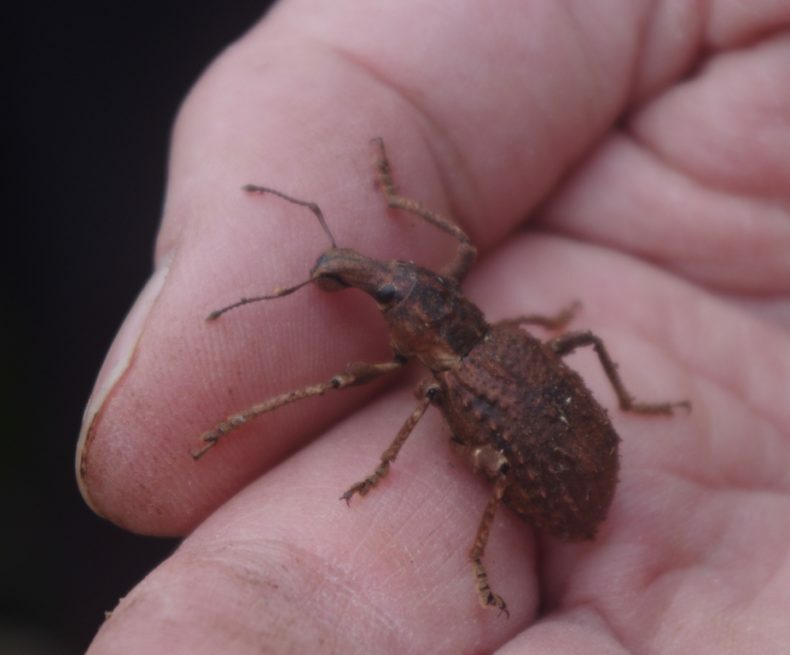 This led to adoption of the common name ‘knobbled weevil’, and greatly increased the potential range for the weevil, as Anisotome lyalli occurs at coastal sites from South Westland and the Catlins to southern Stewart Island. The Te Papa team found Anisotome lyallii on many islands in outer Dusky Sound, and so we were alert to the possibility of finding knobbled weevils there. But they are difficult to find in daylight, and the only animal that we found was during a night landing on one of the Seal Islands. We expect they will be found on other nearby islands if sufficient search effort is made. The flax weevil is perhaps the best example of a relict species in New Zealand. 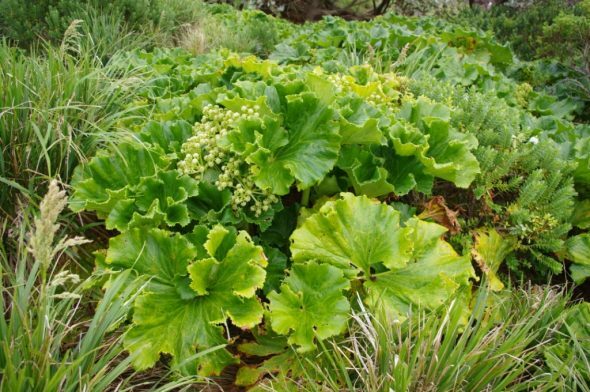 It has been found from the Three Kings Islands (north of Cape Reinga) to Big South Cape Island off the southern tip of Stewart Island, and feeds solely on two of our most widespread and familiar plants – the two species of New Zealand flax (harakeke and wharariki). But like the knobbled weevil, the flax weevil is highly vulnerable to rodent predation and has disappeared from almost all mainland sites. I had previously encountered flax weevils on the Poor Knights Islands off Northland, plus on several islands in Cook Strait, and so was familiar with their characteristic feeding sign. Flax weevils take asymmetrical chunks out of the edge of the flax leaf, leaving ragged, fibrous edges. This is readily distinguished from the sharp-edged, almost symmetrical feeding sign left by the common, widespread flax notch caterpillar (Tmetolophota steropastis). We found flax weevil feeding sign on 28 of the 59 islands that we surveyed in Dusky Sound, which was pretty much everywhere we found wharariki. Live weevils were found on three of these islands, and parts of dead weevils on another two. Flax weevils are very good at hiding during the day, which is why we found few actual weevils. We landed on one ‘wharariki island’ at night, and quickly found four flax weevils, all feeding on the same wharariki plant. Sites where flax weevil feeding sign was noted in Dusky Sound in November 2016. Map based on NatureWatch sightings contributed by the Te Papa team. It was a thrill to find that flax weevils were not only present in Dusky Sound, but widespread and common. Perhaps the bigger surprise is that they had been overlooked before our visit. Many of the islands where we found flax weevil sign are managed for stoat control (i.e. they are regularly visited by DOC biodiversity staff), and two sites are visited by hundreds of tourists every year (public tracks to historic sites on Pigeon Island and Indian Island). 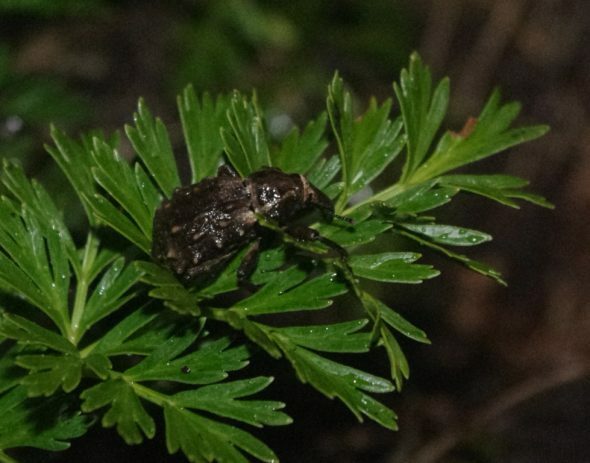 This suggests that with greater awareness of the characteristic sign left by these charismatic beetles, flax weevils will prove to be more widespread in Fiordland than is currently recognised. Beetles (Order Coleoptera) are by far the most species-rich order of organisms on the planet, and weevils (Family Curculionidae) are the largest family of beetles. Spectacular photos. My partner and I are making an educational entomology game based on NZ invertebrates. 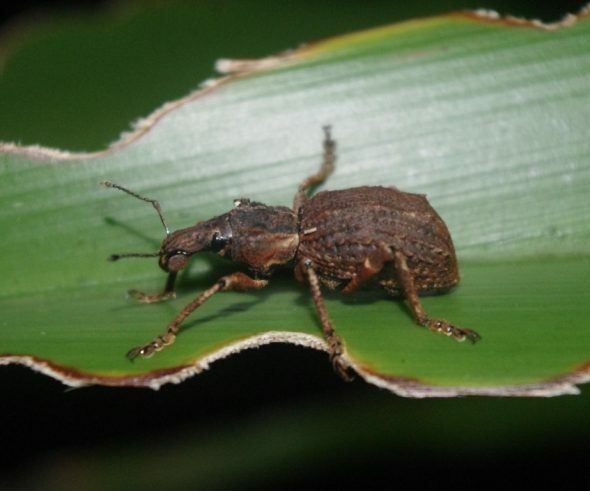 We were browsing through google’s image search and found a few of these flax weevil ones. Would we be able to use the image (3rd from the bottom) as a texture for the models in our games (effectively it creates the ‘skin’ of the model making it look very lifelike)? Very interesting once again, and for the plants as well as for the weevils. Thanks. A year of great blogs from you Colin. Thank you. Thanks very much for your feedback Jacqueline – much appreciated. Another great blog entry with more stunning photos of our amazing wildlife. I think its really important to share information about what rare species are out there, to inspire us about what potential we could have- imagine these large charismatic species in our local botanical gardens (within a rat proof cage), or re-introduced to our mainland islands, so that everyone can see them – it would be fairly inexpensive and could motivate us to make more of new zealand predator free! Thankyou – its really important work that you do! Thanks very much for your comments Mark. Yes, there is a lot of potential for some of these large weevils to benefit from conservation programmes.